Mum has been reading me and Sophie a series about a family called the Penderwicks. 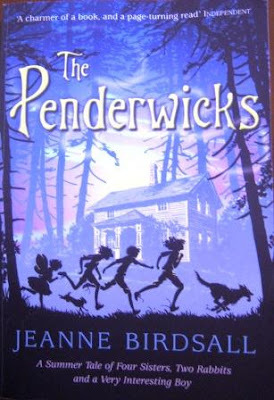 The Penderwicks have lots of adventures with a boy called Jeffrey. They get into lots of trouble in their adventures, but they always manage to get out of it. The Penderwicks are four sisters, Rosalind, Skye, Jane, and Batty. Rosalind is 12. She bakes brownies. She looks after her three sisters. She is the eldest. Skye is 11. She likes to do maths. She also likes to play soccer and do archery. She isn't very patient and doesn't like looking after her sisters. Jane is 10. She to like write books about a girl called Sabrina Starr. She likes to play soccer and do archery. She a bit dreamy. Batty is 4. She likes to play games with Hound the dog. She always wears her butterfly wings. She's a bit shy. Mr Penderwick talks in Latin. The girls can't understand what he says, but they're used to it. We've read two Penderwick books. The first book is called The Penderwicks. The second book is called The Penderwicks on Gardam Street. We're reading the third book now. 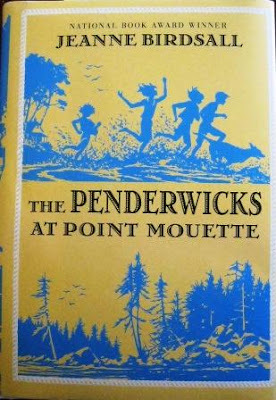 It is called The Penderwicks at Point Mouette. We love hearing about the Penderwicks. My favourite characters are Skye and Jane. Our family loves The penderwicks! We are also reading the 3rd one at the moment. I love Batty, she is soooo cute.